A man who arrived late after the official ceremony receives the citizenship oath from Judge J. Garvan Murtha. 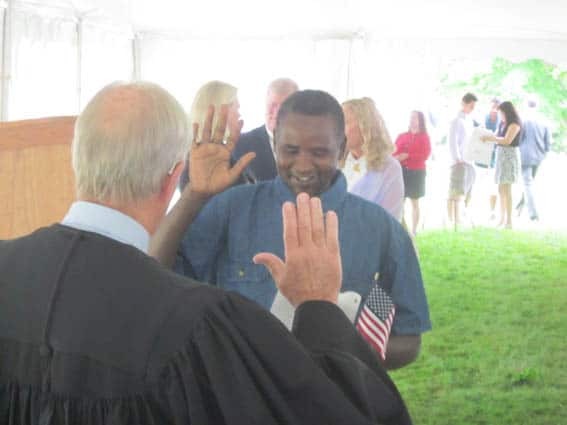 PLYMOUTH NOTCH – Fittingly enough for the Fourth of July, 20 new Americans were sworn at a naturalization ceremony held at the Calvin Coolidge State Historic Site. The new citizens came from all over the globe. Five came from Bhutan, three from Canada, two from the United Kingdom, and one each from Bosnia, Brazil, Ghana, Jamaica, Pakistan, Peru, the Philippines, Sudan, Sweden, and Thailand. Originally from Jamaica, Shawn Woodhouse lives in Middlebury and drives a truck for a living. Gloria Forella Berrora emigrated from Peru. “I just plan to live here, work, and pay my taxes,” she said. Denhart noted that Coolidge himself favored certain restrictions on immigration. In 1924, he signed the Johnson-Reed Act, which limited immigration visas to 2 percent of the total number of each nationality in the U.S., as measured by the 1890 census. Immigrants from Asia were excluded completely. The idea of imposing such quotas originated with Vermont Republican Senator William P. Dillingham, who first proposed the idea in 1917. Federal Court Judge J. Garvan Murtha administered the citizenship oath. “America is a land of immigrants,” he said. “They gave us a Constitution that made our country strong, and they gave us a Bill of Rights. Some of you will prosper more than others. We must all be aware that, though there is opportunity, there is no guarantee of the realization of that opportunity. We must never be complacent or self-satisfied. In accepting the benefits of citizenship, you also accept its obligations. “I am proud, as an American, that you have chosen this country in which you will live and work. Welcome, my fellow Americans,” he added. Murtha said later he was always touched by naturalization ceremonies. For more information about the Coolidge Historic Site and the Coolidge Foundation’s programs visit coolidgefoundation.org.